Web Hosting is required to host files for your website on web. There are plenty of services available and you will see different offers like you will unlimited data hosting, free domains, PHP / My SQL etc in the package and different rates for different packages but you will have to think that which one is for you. To do the same, you go thru reviews, feedbacks etc on web to know bout the hosting providers. There is one place where you can search for best suitable hosting service provider and read a detailed review as well. That one destination is WebHostingRating which is a search catalogue for Web Hosting services to show detail review and offers on one page. 1. Location of the hosting server– If you re going to target a particular location only say China then your website will open faster if your server is located in China. 2. Hosting Type – Whether you want Linux hosting or Windows as a operating system for your server. Or whether you are looking for VPS (Virtual Private Servers) or dedicated servers. 3. Price Range – Of course pricing is a concern while choosing hosting account. 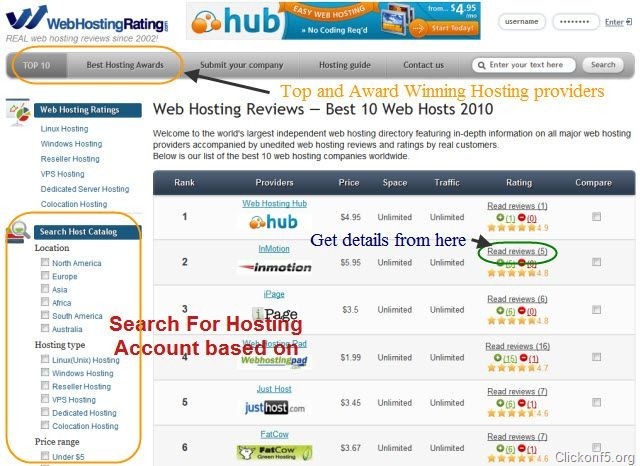 On WebHostingRating, you can search hosting service providers based on your budget. In case you are going to use the hosting account for a CMS (Content Management System) like WordPress, Joomla, Drupal etc, then you can get suggestion for best hosting providers for these type of CMS based sites. Open WebHostingRating.com and if you are not sure about a hosting provider, then go to “Search Host Catalogue” and select different criterions as per your choice. Once you will get results, you can click on “Read Reviews” to get more details about the provider as well as to read user reviews. For example, if I want to have server in “North America” and the hosting type as a Linux based server within a price range of under “$5 to $10 per month”. 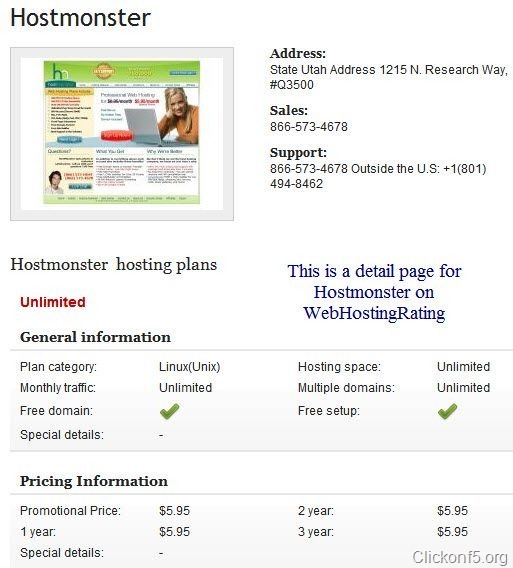 In that case, I get options as Bluehost, Hostmonster, Hostgator etc which are awesome service providers in Web Hosting. To read details, I will click on “Read Reviews” link beside the Web Hosting provider’s logo on result page. If you are not sure about such criterions, you can check “Top 10” web hosting services or “Award Winning” providers using Top navigation menu. I find this search catalogue a very good portal for making a decision before choosing right hosting provider. As once you will start hosting your site, you don’t want much downtime or issues with hosting account and that’s why I always recommend to give more and more time before buying good hosting service provider and WebHostingRating will do the same for you. Details page for each hosting account listed on WebHostingRating has General Information about the hosting service provider, Pricing for different packages, Database, Domain Features, Email options, Server and Security Information etc. You can also read user reviews for a particular web hosting provider on the bottom area of the detail page.